While my husband and I are dragging our feet about getting our 3-year-old son involved in sports (we know we want to, but when, what, and where? So many unknowns! ), one thing we’re certain of is that we want him to develop a deeper love of music. 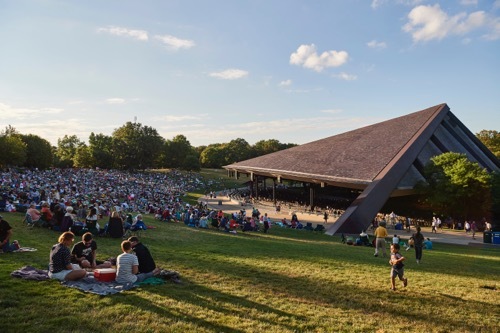 Before he even turned 1 year old, we have taken him — and now his little brother, too — to at least one summertime Cleveland Orchestra concert at Blossom Music Center each season. The Blossom Music Festival events are low-key, affordable concerts that are perfect for families — parking is free and guests ages 17 and younger get free lawn seats as part of the “Under 18s Free” program. Studying the programs during the concert. It’s now about halfway through the 2017 season, so there are still plenty of opportunities left for your family to enjoy spending a night under the stars while listening to our very own world-class orchestra. As with all outings that include young kids, timing is key. Our boys’ usual bedtime is 8 p.m., so when checking the concert offerings at the beginning of the season, we only consider shows that start at 7 p.m., as opposed to later options. That way, we can get the boys home and in bed sooner to avoid crankiness the next day. Plus, our youngest would probably have an exhaustion-fueled meltdown waiting for a later show to start. We love arriving early and bringing a picnic dinner. The boys are excited to spread out on a picnic blanket and enjoy eating in a different setting, and this leaves plenty of time to walk around and burn off energy before the concert begins. And, as an added bonus, you’ll get closer parking the earlier you arrive, which makes for a faster exit to get the kids home and in bed sooner. When you arrive, scout out a picnic spot that will work best for your family, whether it’s close to the restrooms for a potty-training toddler, or on the outskirts of the lawn seating area so there’s more room for energetic kids to roam. We usually opt for a spot near the main walking path, which is helpful when leaving, and also allows for a quick and easy escape with the stroller in case our youngest gets noisy and needs a calming walk. We also bring toys, books and magazines, binoculars, and coloring books. This time, we brought our 1-year-old’s PJs along and did a quick change during intermission so that when we got home around 9:30, he was already set for bed. If you’re worried about keeping your young kids quiet and entertained, I suggest attending with another family, or inviting your kids’ grandparents to the show, too. More helping hands means a smoother outing for everyone. Buying tickets in bulk will also cut down on costs; we always buy a Blossom Lawn Ticket Book, which includes 10 lawn tickets and two pavilion upgrade vouchers. This year, that meant each adult’s ticket ended up being $16. The 10 tickets are enough for us to enjoy two shows with the kids’ grandparents. Previous article The Flats are Back! Next article Getting Your Toddler to Take Medicine She Hates: Your Input Needed!